Rainwater is a free resource you can use for a variety of non-drinking purposes, and rainwater tanks are the most effective way to collect water from the sky in large volumes. 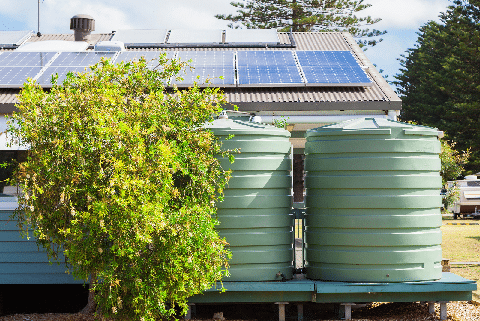 If you’ve been exploring the Perth market for your home’s first rainwater tank, you probably already have the material, capacity, and shape in mind. Local regulations. Councils usually impose certain restrictions on tank placement, particularly on issues of overshadowing (as tanks can run several metres high) and boundaries. Additionally, if your tank exceeds 10k litres, some form of planning permission is typically involved. Check local government rules and regulations first before purchasing a tank and know under what conditions you can be exempted. Water catchment. When selecting a spot to place your tank, also consider where it can capture the most water relative to your roof area. To maximise water catchment, the gutter, roofs, and downpipes must be free from depressions or blockages that could cause dirt, leaves, or stale water to accumulate. You can use diverters and leaf strainers on these areas to ensure proper flow and drainage. Overflows. Assuming your tank is full, where would you direct excess rainwater? You can install a shut-off mechanism, or better yet, reserve an extra space should you decide to fit in an extra tank in the future to maximise water capture. For a lower installation cost, it would be best to place the add-on close to the downpipes nearest to your home. Stability. Choose an area whose foundation is sturdy enough to support the tank even if it’s full. A massive tank filled at maximum capacity perched on a timber stand poses significant hazard. Find a firm and levelled surface made of durable concrete or paving for better safety. Moreover, mind the amount of stress the tank may cause when placed beside walls or near pipework. Nuisance. For a peaceful rainwater-saving experience, consider your neighbours. See to it that your tank does not obstruct their ventilation, block natural light, or undermine the beauty of the neighbourhood or community. If you decide to install pumps, opt for those with covers to stifle noise and to avoid disturbing other people. When shopping for rain water tanks around Perth, don’t hesitate to share your concerns and ask questions. An expert from companies like Rainfill Tanks and Curved Roofing Supplies will be more than happy to help you find the best tank suited to your needs.